CORRECTION: Regarding time-stamp 12:11. Please understand that I misspoke saying “water and spirit.” I do not teach that you must be water baptized to be saved. Bear in mind that I was preaching while walking, with no pulpit, no script, and lots of distractions and interruptions. But you should be water baptized after salvation. When the bell rings at this school the students disperse at all four sides. Consequently each exiting crowd is small. Disruptive yes, but not disrespectful. Why disruptive? Because “For the preaching of the cross is to them that perish foolishness; but unto us which are saved it is the power of God” (1 Cor 1:18). The principal came out and kindly spoke to me. The school police/security stood by, but did not intervene. Imagine if the O.T. Prophets, Christ, and/or the Apostles stopped preaching (or moved) every time a sinner asked them to. Many people heckled and cursed at the message, while others watched with much interest. One student ‘took a stand’ and passed out my Gospel tracts. Other students thanked me for preaching the Gospel. Side note: This April while street preaching in Texas, I started preaching thru the book of Psalm. 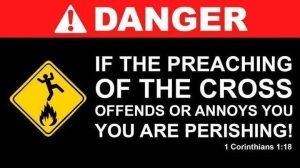 Thou not a thorough expository teaching, most of the passages are a great place to preach from. I’m almost done with this book.